This super cute poster is the perfect wall decoration for any girl's bedroom. Created with various pastel tones, this art print comes in size 12x16 inches and fits a standard frame size. Depicted is a sweet unicorn face with long eyelashes and flowers around her horn. Inspiring and literally colorful messages fill the poster, such as, "Anything is possible," "There is magic inside you," and "Dreams can come true." Faux gold glitter decorates the print alongside subtle lavender, pink, and light teal stars. Inspire any young girl with this gift of magic! PERFECT FOR ANY OCCASION: Funny gifts girls. 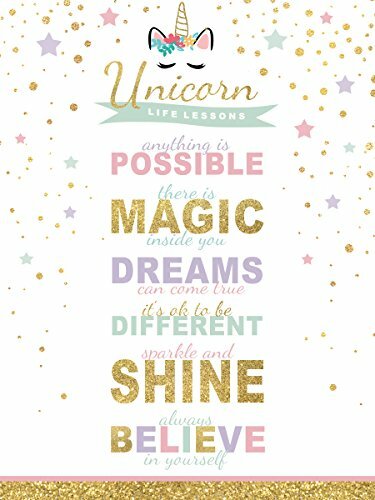 Whether you're looking for bedroom decor ideas for your daughter, birthday gifts, or just looking for premium quality girly wall decor or merchandise, this cute print is perfect for every occasion!